Boulder City has five singles players and five doubles teams competing in the Division 1-A Southern Region Tennis Championships that started Wednesday and continues through Saturday at three sites in Las Vegas. The Eagles have two boys’ singles players and two doubles teams in the competition; the Lady Eagles have three girls’ singles players and three doubles teams. Melissa O’Berto is the top seed in the bottom bracket in the round of 32 region. Teammate Taylor Finn is the No. 3 seed. Natalie Fullmer is No. 32. In the doubles competition, Boulder City’s Alexis LeMaster and Sarah Gneiting are seeded No. 1 and received a first-round bye. Their first match is today. The Lady Eagles team of Maddie Montgomery and Arianne Hess is seeded third and began play Wednesday. The team of Kira Yamamoto and Makenna Frazier is unseeded and began play Wednesday. In the boys’ singles competition, Boulder City’s Gavin Morris and Facio Gomez are unseeded. Their first matches were Wednesday. In the boys’ doubles competition, Boulder City’s Eric Gros and Tyler Lyon are unseeded, as are Jacob Harrison and Charles McCallum. Their first matches were Wednesday. Play began Wednesday in the round of 32 and continues today with second-round matches and quarterfinal matches at The Meadows School and Darling Tennis Center. The semifinals are Friday at the Darling Tennis Center and the finals are Saturday at Bishop Gorman High. 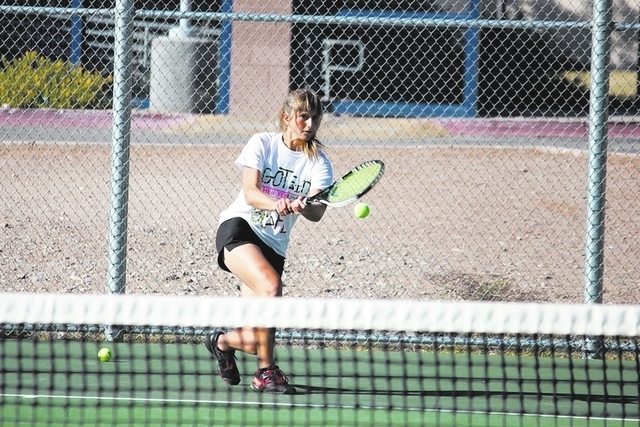 The Boulder City girls’ tennis team clinched first place in the Sunrise League for a second consecutive year with a victory against Moapa Valley in Overton on Oct. 4. The Lady Eagles advanced to the Southern Region Team Tournament Oct. 8 where they played at home against The Adelson academy and won 13-5. Finn was 2-1 in singles and Fullmer and Montgomery were 2-1 in doubles in the quarterfinal match. On Oct. 9, Faith Lutheran defeated Boulder City 14-4 to end the Lady Eagles’ team season. They ended with a 13-1 record. The Eagles boys’ team ended with a 3-7 record and did not qualify for the region team tournament, but they have the two individuals and two doubles team competing this week in the Division 1-A Southern Region singles and double championships.